We've heard a lot from the Democrats about income inequality. Barack Obama called income inequality the "the defining challenge of our time" [Kaplan, Rebecca (4 December 2013). Obama: Income inequality "the defining challenge of our time". CBS News. Retrieved on 21 February 2014.]. State Senator Horacena Tate, Chairman of the Georgia Senate Democratic Caucus, said, "Income inequality in Georgia has to be at the forefront of every legislator's mind as working families continue to face serious economic challenges." Tuesday, the Huffington Post compiled a map of the mot unequal counties in America based on data from the Census Bureau’s 2013 American Community Survey. "In this case, inequality is derived using the Gini coefficient, which is a statistical measure of the gap between the rich and the poor. The index is based on a scale from 0 to 1, where 0 represents total equality and 1 represents total inequality," the article reads. 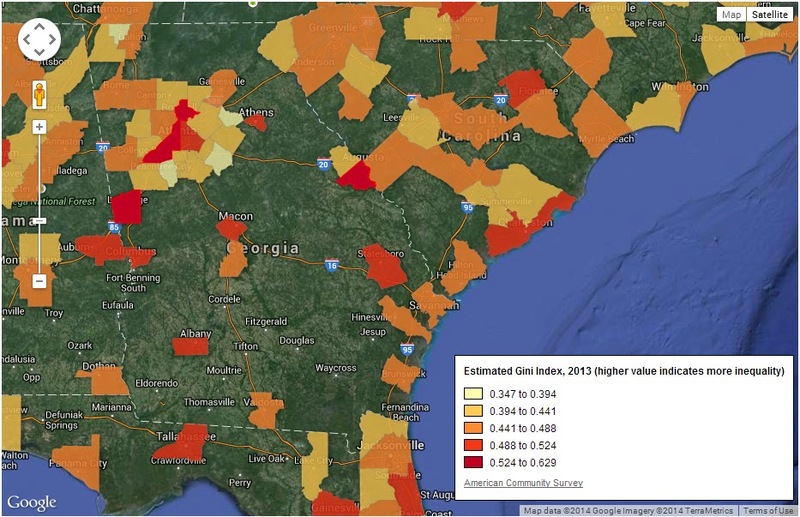 "Counties with high inequality are shaded in red. Counties with low inequality are shaded in yellow. Areas with no shading represent counties that have fewer than 65,000 people, as the Census does not collect annual inequality data for small counties" [Cohn (23 September 2014). Here Are The Most Unequal Counties In America. The Huffington Post. Retrieved on 24 September 2014.]. In Georgia, the counties with the deepest shade of red and orange represent the areas in the state where the gap between rich and poor is widest. These counties --Fulton, DeKalb, Muscogee, Athens-Clarke, Macon-Bibb, Augusta-Richmond, and Dougherty-- reliably vote Democrat come election time. But, if one is to believe the Democrats, the income inequality in counties they control is due to Republican treachery.